Are you aware of $32 entry-level Android tablets available for local resellers around the world? Are you aware that this is the price of Intel’s upcoming in October 2013 Bay Trail-T Z3740 SoC, i.e. a chip only? Are you aware of the fact that in October such entry-level Android tablets will get a lower power consumption and better performance Allwinner A23 SoC @1.5GHz instead of the current A13 @1/1.2GHz? 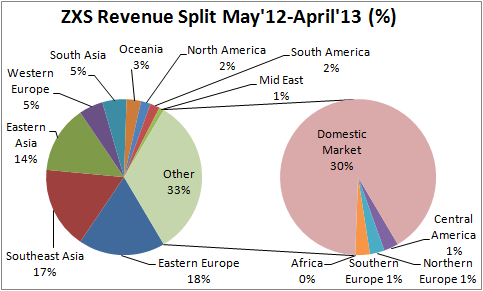 Are you aware that in a year from now the wholesale price to local tablet resellers can go down as much as to $20? If you are not aware of any of these things you should read this post in order to understand how is that made possible with, what I am calling, “race to the bottom” ecosystem. An ecosystem which is outside of the manufacturing ecosystem of the well known worldwide brands. An ecosystem which is already threatening to the “old guard” to such an extent that even Orders for 2nd-generation Nexus 7 for 4Q13 may shrink sequentially, say Taiwan makers. 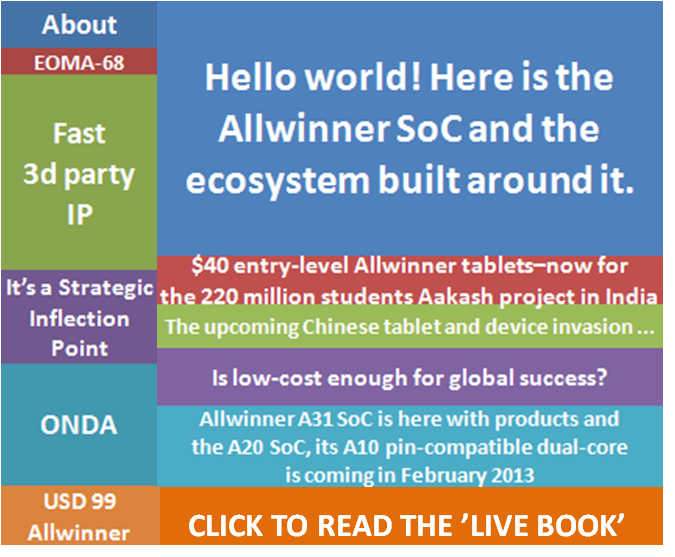 The mission of USD 99 Allwinner | A lethal threat to the world of Intel, Apple, Microsoft, Qualcomm and the rest site has been to show the true factual nature of the “race to the bottom” phenomenon since the launch of the site in Nov 26, 2012. The manufacturing side has been a particular focus of the entries on this site ever since. Especially, as early as Dec 21, 2012 I published a special permanent page solely devoted to products coming out of Allwinner’s keading device partner, ONDA Technologies, Inc and its OEM/ODM arm, Shenzhen Neostra Technology Co. Ltd.
Neostra was an 800+ strong manufacturing company in Sept 2012, and according to a previous company website it had monthly production capacity of 200,000 units back in April 2010. So Neostra is a kind of larger manufacturing company in Shenzhen and elsewhere in China. What about the large number of smaller ones which are the backbone of, what I will call here, “race to the bottom ecosystem”? Next year? We’ll have $20 7″ Android tablets for sure. And don’t tell me they are crap, they aren’t, try them for yourself. Android runs extremely smoothly, it comes with Mali-400 graphics, all is fine. You can even choose a double-capacity battery for maybe about $2 more so it can run 6+ hours on a charge. Note the fact mentioned in the video that in case of large orders ZXS can give parts of the orders to two other companies which belong to the two brothers of the founder. So the $5 price told in the ZXS Tablet Factory Tour video given earlier is really a typical price for those tablet vendors. Replacement Touch Screen: http://goo.gl/eJdtDz Repair Guide: Disassembly 7 Inch AllWinner A13 Q88 MID Android Tablet PC for Replacement Touch Screen Digitizer Glass Panel, LCD AND Battery etc… Repair Guide: How to Repalcement Touch Screen for AllWinner A13 Q88 MID Tablet PC The touchscreen had cracked. Actablet.com – China professional tablet PC accessories wholesaler. Compatible: 1. 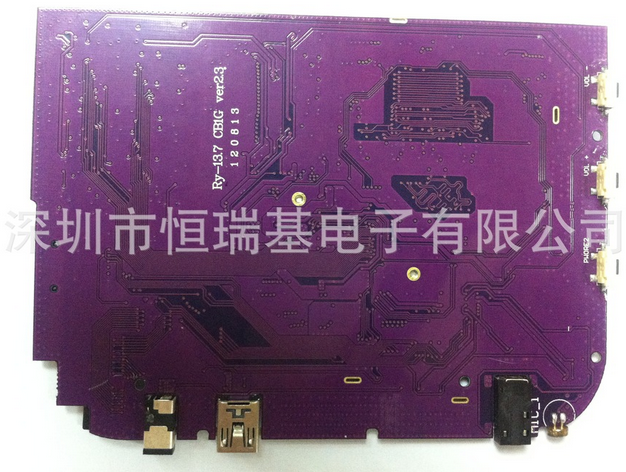 Allwinner A13 Q88 (or Q8 / Q88+ / Q88S) 2. 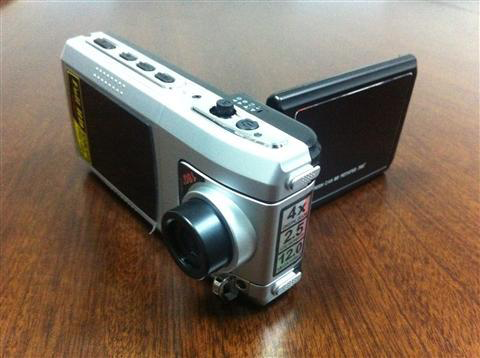 OEM/ODM Version (Different brand names, Dual/Single Camera, Black/Pink/Blue/Purple/White/Red/Yellow etc.) 3. Rockchip RK2928 Version 4. InfoTMIC iMAPx15 Dual Core Version Anyway, just the same appearance. It will support. Brand new Touch Screen Brand new 3000mAh battery:http://www.actablet.com/yt_p4511.html Brand new LCD display screen:http://www.actablet.com/yt_p6080.html Open the device… Disassemble touch screen plug Disassemble touch screen Broken one Tear tapes Connect touch screen plug You can use the touch screen now!!! Actablet.com – China professional tablet PC accessories wholesaler. Thanks! Since the battery of the ZXS tablet shown before is only 1800mah that should cost even much less. The supplier’s company premises has been checked by Alibaba.com staff to ensure onsite operations exist there. A third-party verification company has confirmed the legal status of the supplier. 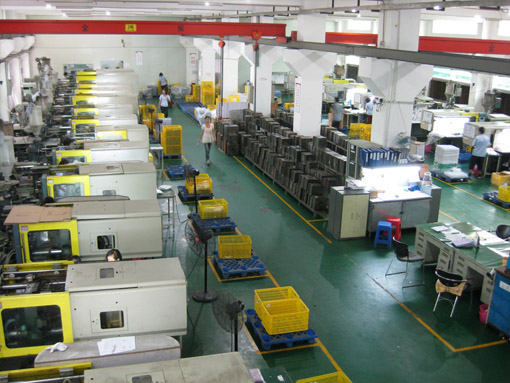 There are thousands of PCB, PCBA and Plastic/Metal Case manufacturers all over the world. But we are the company which integrates all of them. 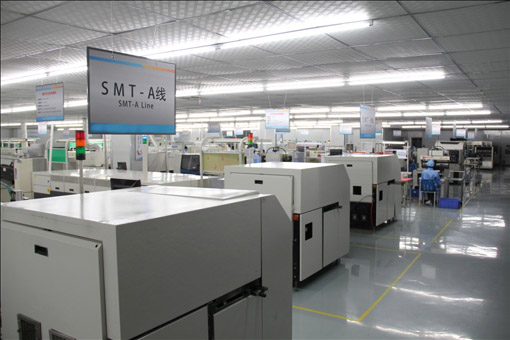 And we posses professional PCB, Plastic/Metal Case, SMT and complete components supply chains, so we have capability to control each process of the whole production. Many world famous companies have gotten qualified products with good service from us. To learn more details about us, please mail or call now. You will know how good we can do for you in the real cooperation. 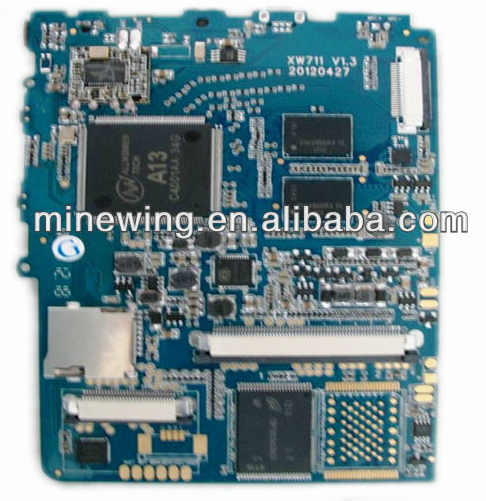 Minewing (Shenzhen) Electronics Integrated Co., Ltd is a comprehensive enterprise established by combining Shenzhen Mineway Technology Co., Ltd and Win2000 Telecom Co.Ltd. We have more than 10 years’ experience in all PCB, PCBA and Enclosure. From quoting, technique, production, Assembly and function testing, all can be got professional control. We have imported advanced equipments [from] abroad and employed proficient workers who have many years’ experience in the same area. The products we have made now are involved in Medical Device, Communication, LED, Safety, Consumer Electronics and Traffic. Our Quality and Service has been accepted and approved by customers from domestic and abroad, like Bosch, HTC, Softbank … You can get the product which is much more better than your imagine from us as long as you choose us. So none of them were recognizing the real “race to the bottom” phenomenon affecting the another tablet market, where the playears were also actively engaging in the formation of that market since its relatively early stages of development. Shenzhen Zhixingsheng Technology Co.,Ltd. [深圳市智兴盛电子有限公司] Founded in 2007, located in Shenzhen, the Electronic Information Industry Base in China, is a High-tech enterprise specialized in researching, developing, manufacturing and marketing tablet pc and car black box. Committed to the development of trendy Tablet PC and car black box, with the purpose of features highlight, innovative and stylish design, Yelaw is enhancing competitiveness in the world of industry continuously growing and our products are more attractive with the pursuit of excellent. The factory covers an area of 5000 square meters with 200-300 workers and 15-20 engineers. Every month 100,000 production capacity can satisfy your order quantity. Professional R&D staffs dedicated to the creation of new and innovative products. With over 5 years of experience in developing new designs, a powerful tool center, and modern facilities, our R&D department can fulfill our customers’ specialized OEM orders. Strictly QC controls the products quality. Your factory audit is welcome. We always adhere to the principle “Quality is the soul of enterprise”, strictly on various aspects of production, to produce reliable quality products which are well received by users. Meanwhile, we study and update products constantly to ensure them are continued best-selling in market. We can provide customers with OEM/ODM manufacturing service. With the company aim of “Credibility is life, Customer is God”, the accumulated experience in the field, we are growing our sales group, and establish very good relationship with domestic and foreign customers. Nowadays, our products have been exported to Taiwan, Korea, Russia, Southeast Asia, the Middle East, Europe and North America etc., and gain a great reputation. Yelaw always achieve win-win situation with his partners on the basis of principle of “Equality, mutual benefit and long-term cooperation”. Sincerely welcome all suppliers agents join the cooperation.